The volunteers in the multimedia booth are responsible for all that gets displayed on the auditorium projectors and all of the monitors placed throughout the GNG ministry center. 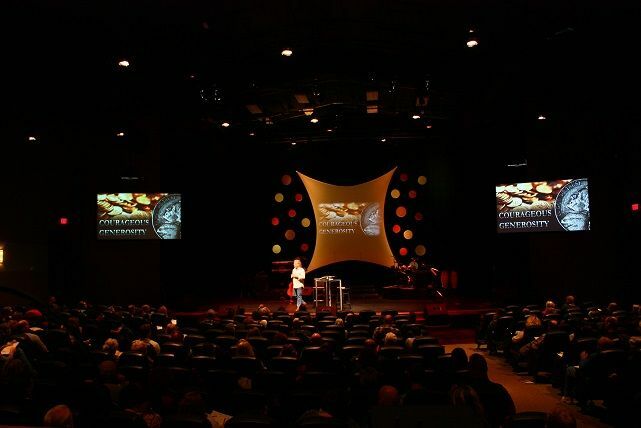 They create all of the display content for each Sunday service for each lesson and control when the information is displayed during the service. In the video room, there are usually two or more people operating the system. One person controlling our display software and another doing the video and camera switching. It sounds complicated but it’s not once you learn the process. You are fully trained before you have to fly solo. We always need volunteers for this area and it is an important job to perform. When you work in the video room, you are in a separate closed room off of the auditorium. You sit at our video console and control the video systems from there. If this sounds intriguing to you, check into volunteering for the Video Team. We invite you to experience GNG soon. We are a group of Christ followers with a purpose to "develop seekers into fully functioning followers of Christ". Come join us in this adventure.